THE MARCO POLO APARTMENTS: A 36-story wave shaped condominium building overlooking the Ala Wai Canal near Waikiki. Firefighters are at the scene of a five-alarm fire on Kapiolani Boulevard. 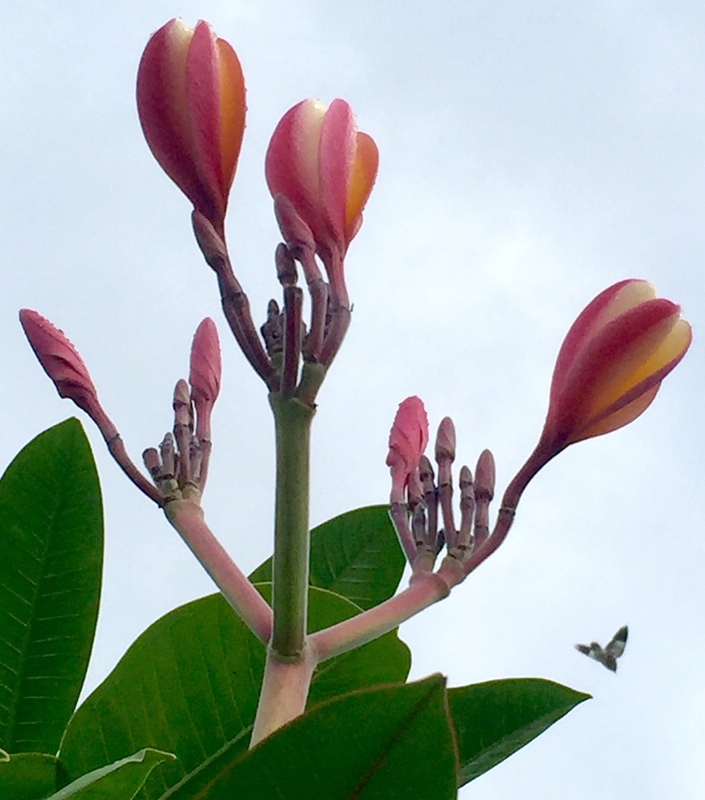 EVENTS DURING DAYS 1 TO 4 (Friday to Monday): In the early afternoon of July 14th, the smartphone news alerts began rolling in about a seven alarm fire raging on the 26th floor of a thirty six story condominium tower in the heart of Honolulu. The fire ultimately devastated three floors containing approximately fifty apartments, with over a hundred firefighters battling five hours to bring the high-rise blaze under control. During the initial hours of uncertainly, our community watched social media reports of many residents sheltering in place while others waited behind barricades outside, wondering about their family and friends inside a burning structure of almost six hundred apartment units. We viewed the fear and tension among everyone concerned. Tragically, a 54 year old Hawaiian Airlines in-flight manager, his elderly mother, and their pet dog perished in one unit, while a 71 year old dental assistant retiree succumbed in another apartment. Their families share remembrances about their loved ones in these interviews. In a blink of an eye, many of us seniors normally preoccupied with the day to day struggles of physical ailments and the high cost of medical and living expenses in Hawaii are counting our blessings compared to the plight of the many displaced Marco Polo fire victims, a number of whom are elderly and on fixed incomes. We are grateful for the bravery of the first responders who worked tirelessly into the night to bring the blaze under control, the efficiency of government leaders including our city mayor mobilizing on site, and the compassion of Red Cross/Salvation Army volunteers and other charitable organizations bringing resources to the victims. It's heartwarming to see the community outpouring of donations being walked into the Marco Polo lobby, as well as the business community aid being organized, including a $100,000 grant from Associa, the Marco Polo condominium management company. However, given the uphill battle that many of these victims face, with over 200 apartments dealing with water and smoke damage, so much more is needed. As reported by KHON2 news linked here, cash donations are the immediate priority at this point. DAY 5 (Tuesday) MESSAGE FROM ONE FIRE VICTIM SURVIVOR TO OTHERS - Three years ago, my husband and I were sitting down to a routine evening with our beloved dog and cats, when a fire ripped through our two bedroom wooden townhouse within minutes. Nothing can describe those panicked moments of trying to locate our pets, getting away from the flames, and banging on the doors of our neighbors to warn them. I can only imagine the feelings and thoughts of those of you in the Marco Polo building, waiting hours to be told what to do and where to go next. The shell shock lasts for days, even as you sit at the shelter realizing that you're safe, even as friends and neighbors walk up to you and press money into your hands. The daze continues when you go back and view the wreckage of your home and realize that not only all your possessions are gone, but all the things that those items represent. Irreplaceable objects passed down from generations of your family, mementos from past life events, creations by your children who are now adults. In my case, we also no longer had our vehicles and we didn't know whether our cats had safely exited. As difficult as this may be for you to believe today, as you grieve for everything that you've lost, things will get better. You will deal with the maze of replacing your identity and day to day documents, realizing for the first time how many different institutions you need to deal with, your bank, the DMV, etc. You may undergo the frustrations, as we did, of years of restoration before the home that you own becomes livable again. But you will be uplifted by the outpouring of support. My family rallied around us, and we were so fortunate that my sister was able to provide us with her rental so that we could have a base station to work from. Her generosity and the kindness of everyone, including total strangers, enabled us to get through years of recovery, and the slow rebuilding. Many helped us, and in particular we are so grateful for the Red Cross' aid on our behalf. We have just donated to them today and are happy to have an opportunity to pay it forward, because the Marco Polo project is one of the largest disaster relief cases that the Hawaii chapter has been involved with. Kudos to local entertainers and radio personalities who are banding together to perform a benefit concert at Ward Warehouse on Wednesday evening, with proceeds benefiting the Red Cross for Marco Polo aid efforts. DAY 7 (Thursday): SOCIAL MEDIA GRASS ROOTS - There's been generous support from large businesses such as Safeway and Home Depot, but we're also seeing grass roots aloha from home and small businesses. Let us explain: Our dogs' Instagram account has six times the number of followers compared with our page, so cute pups win the popularity contest over senior citizens hands down. Because we wanted to remember the small pet that perished in the fire, we posted a link of this webpage to our Instagram dog account. The resulting comments by viewers from the California west coast to the New Jersey shore were heartwarming, including donation offers from Ohio. Thoughts and prayers came from as far as Italy. The feedback from the local home and small businesses have been incredible, from the AirBnB owner who has offered to donate one week's use of her home to displaced fire victims, to the Etsy pet accessories maker who is designing a special edition dog bandana with a portion of the proceeds going to the Red Cross. These types of donations represent a significant part of a home/small business owner's resources and income, so it's such a wonderful demonstration of our island aloha spirit. Stay tuned . . .
DAY 8 (Friday): BENEFIT BREAKFAST The Red Cross will the beneficiary of Finance Factors' annual charity breakfast, taking place at their building courtyard in the heart of our downtown financial district (1164 Bishop Street) during 6:30 to 9 a.m. on Friday, the one week anniversary of the MP fire. Details for the $6 breakfast are included in this KHON2 video. BBQ and WINE - Local businesses are beginning to dedicate a portion of their daily proceeds to Red Cross Hawaii for MP relief efforts. On Wednesday, L & L Hawaiian Barbecue donated 10% of its Ward Entertainment Center location sales. A portion of Wine and Canvas Hawaii's Friday painting session seat purchases are being set aside. Finance Factors charity breakfast from 6:30 a.m. to 9 a.m. on Friday. Wine and Art Hawaii fundraiser in Waikiki for the victims of last week's Marco Polo fire . 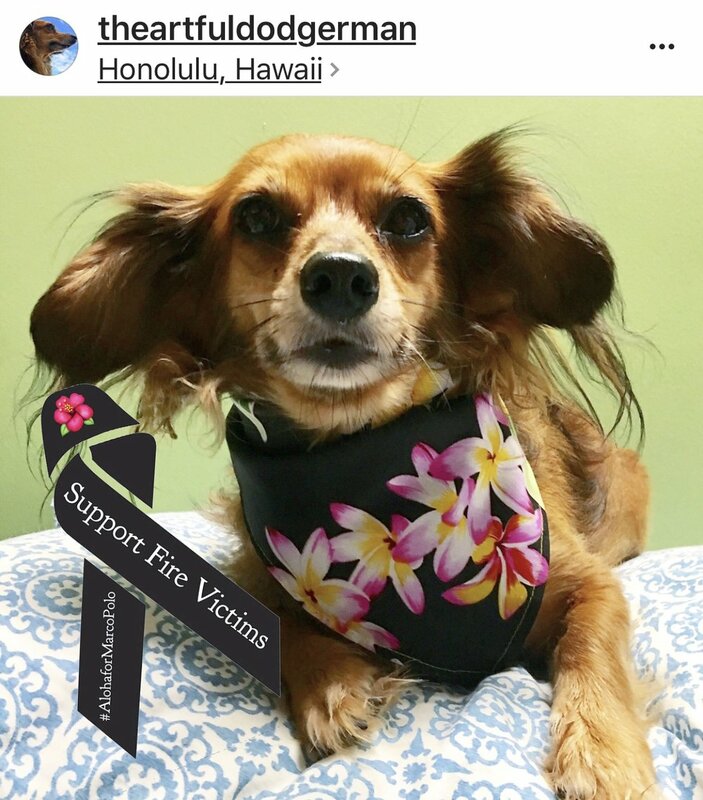 DAY 9 (Saturday): DOG LOVERS SHOW ALOHA - As we mentioned on Day 7, pet owners are rallying through their social media accounts to raise cash donations. We are so happy that Kiara Sakamoto, a long time animal lover, artist and zoologist, reached out to us. Her Etsy shop, Fuzzologist, lists products and art inspired by her own pets and created with love. Kiara has designed a limited edition black aloha print bandana for pets, modeled here by her own fuzzy chiweenie Dodger. Through collaboration with her friend Corinne, a matching bow tie for humans is also available for pre-order. Kiara and Cori are donating 75% of the total sale price directly to the Red Cross of Hawaii, earmarked specifically for the victims of the Marco Polo fire. Please consider showing your aloha to help our neighbors, friends, and family get back on their feet. The bandanas and bowties can be pre-ordered at the Fuzzologist Etsy Shop via the link button below. Kiara and Cori's Instagram accounts respectively are @fuzzologist and @crimson_dyn4m0 if you'd like to follow their posts. Mahalo to them both for their generosity, creative hard work and compassion. 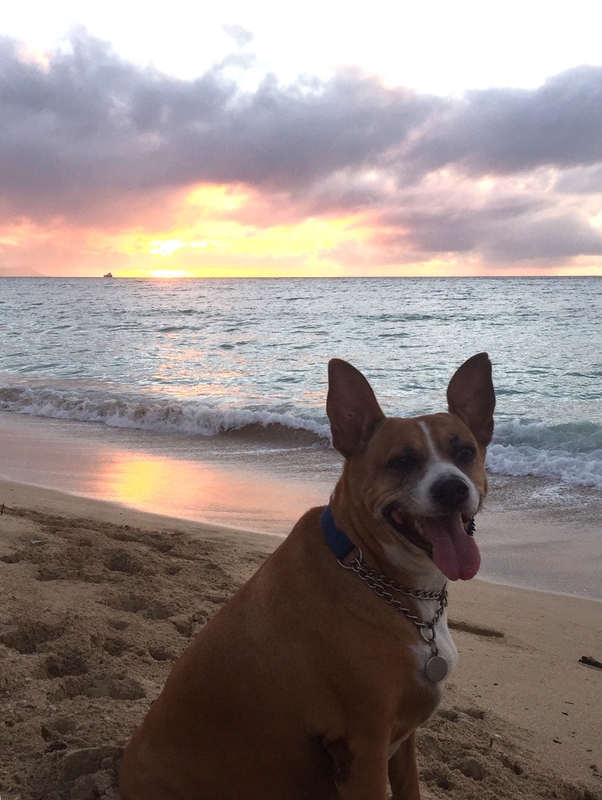 Thank you to those who have already ordered, we can't wait to see the posts of your furbabies in their aloha wear. DAY 10 (Sunday): On a day when most of us are off from work, church groups and families are gathering supplies for those in need. MP residents have been going through the processes of insurance claims, inspections, cleanup, and applications for financial aid. The condo management company reports that the focus is expanding to other needed services, such as counseling and childcare, to provide a positive atmosphere while MP residents are trying to adjust to a 'new normal'. We are waiting to hear from some of our Instagram accounts that have family within the building as to what support services and items would be the most helpful at this time (and anyone can email us via the 'Contact Us' link above). Aloha came full circle on Tuesday when residents, volunteers and first responders came together for 'Taco Tuesday'. What a wonderful way to acknowledge everyone's efforts and gratitude for the donations that have poured in from the community. DAY 15 (Friday 7/28/17) IN CELEBRATION OF BRITT RELLER'S LIFE: Funeral services for Britt Reller, a Hawaiian Airlines in-flight supervisor, will be open to the public at Central Union Church, with the visitation beginning at 10 a.m., followed by the memorial at 11, and a reception afterwards. Over 2,000 members are sharing their memories of this wonderful man via the Facebook group "Remembering Britt Reller" linked here: https://www.facebook.com/groups/305930513202192/ The people he touched around the world will raise a glass at 11 a.m. HST in celebration of a life well lived, though ended too quickly. WEEK THREE (July 28 to August 3): Residents of the heavily damaged units are getting the bad news assessment that it may take six months to a year before their apartments can be occupied again. Initial damage estimates are topping $100 million at this time. Personal possessions in other units, e.g. water damaged apartments, may not be returnable to the owners due to hazardous materials exposure. Unless the property owners can pay for professional hazardous material cleanup (usually out of pocket if not covered by rental or homeowners' insurance) by restoration companies, their belongings may need to be destroyed. Bloomingdale skincare and beauty experts will be providing TLC sessions in the Marco Polo lobby this Friday and Saturday afternoon (2 to 6 p.m.) including makeup and skincare sample giftbags along with hand massage and makeup/skincare sessions. The resident management team on-site has listed the following donation items as being especially helpful at this time: Personal hygiene items such as toothpaste, toothbrushes, denture cleaner, hairbrushes, shampoo and conditioner, toilet paper, paper towels, Q-tips, lotion, etc. Gift cards are also appreciated, especially for nearby vendors such as Times Supermarket, Safeway, Zippy's, McDonald's, Burger King, Jack In the Box, Taco Bell or 7-11). Progress updates to the condo residents and interested parties are being provided on the management company's Facebook page located at https://www.facebook.com/AssociaHawaii/ and we invite anyone with additional helpful links to contact us for inclusion here. During the upcoming weeks, our band of seniors will look into organizing fundraisers and we'd welcome your ideas and help for various ways to aid our unfortunate island neighbors. Our hope is that we can consolidate our skills and resources to bring back some comfort and aloha to those who have lost so much. ALOHA FROM JENNIE: A senior in his mid eighties recently told me how blessed he feels to have enjoyed a rewarding professional career, grown children with excellent accomplishments, and good health for he and his wife enabling them to still travel and cruise at their age, He further added that part of his contentment is due to knowing that when the time comes, his final resting place as a military veteran would be the National Memorial Cemetery of the Pacific. He happily described shady trees and eternal tranquility. 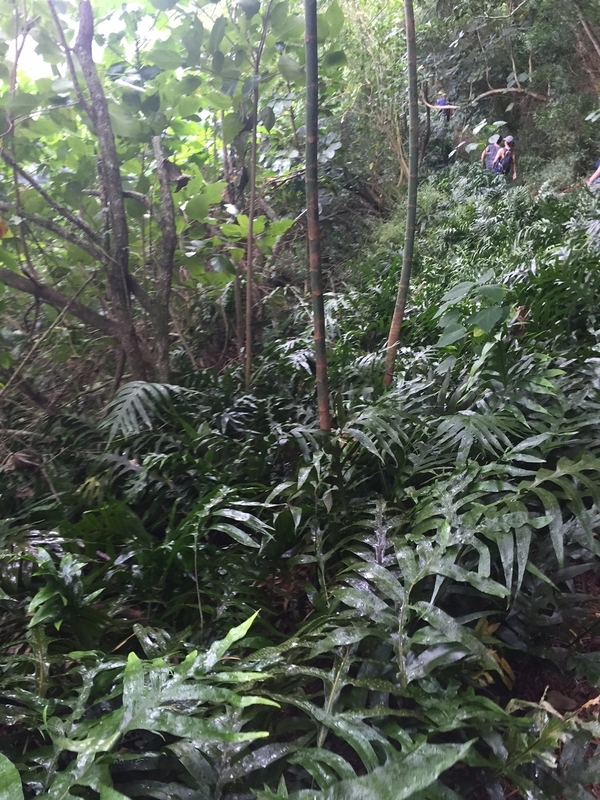 This discussion piqued my interest to visit these federal grounds located in Punchbowl Crater, an extinct volcanic cone created 100,000 years ago, located on the island of Oahu. 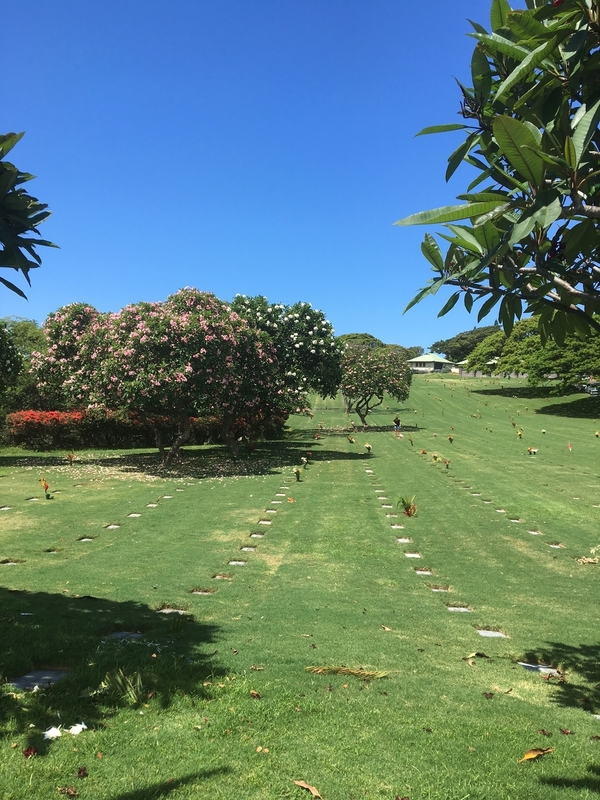 The cemetery was dedicated in 1949 and is now the serene home to over 50,000 interred military fallen, veterans and their dependents. Lookouts throughout the 100+ acres of beautifully maintained land provide a panoramic view of Honolulu, Diamond Head, the ocean and our mountains. 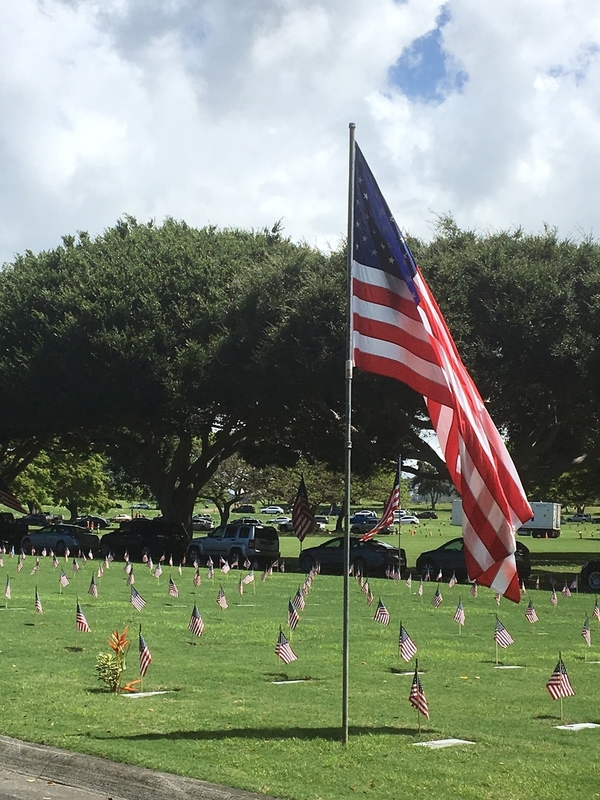 Video of National Memorial Cemetery of the Pacific Memorial Day 2016 weekend ceremonies including a 21-gun salute and the playing of taps. Memorial Day weekend was an especially fitting time to visit and honor our military. On Sunday, the local Boy and Girl Scouts troops were out in force, as it's their tradition to place flags and flower leis on each of the flat grave markers before the Monday occasion. The community is involved throughout the weeks leading up to the event, gathering flower blossoms, stringing leis and dropping off the floral donations at local firehouses for use on this special remembrance day. Ceremonies of tribute are conducted throughout the weekend, including a twenty-one gun salute and the playing of taps as seen in our above video. 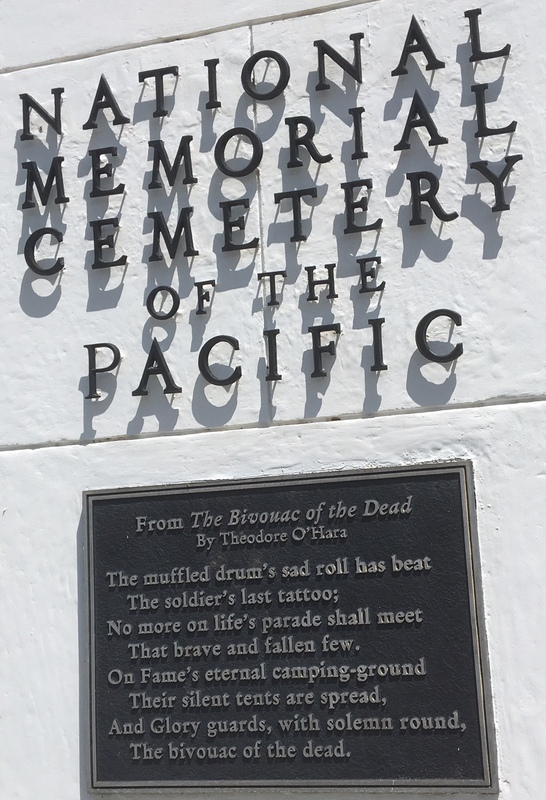 As seen in this video, the Honolulu Memorial within the cemetery grounds include beautiful hallways flanked by mosaics illustrating the various military campaigns from World War II through the Korean and Vietnam Wars. 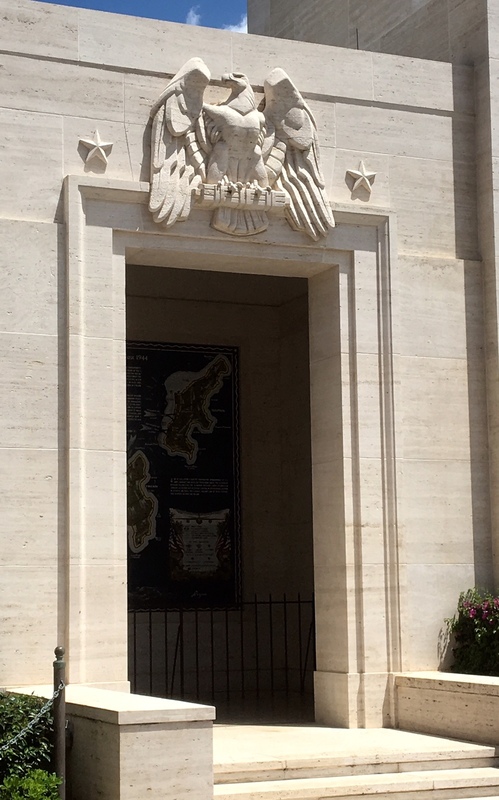 Military personnel are memorialized on marble slabs in the courtyard, and a chapel and water treatments add to the solemn environment. The Statue of Lady Columbia, which is featured in the opening credits of the TV series, Hawaii Five-O, represents all grieving mothers. 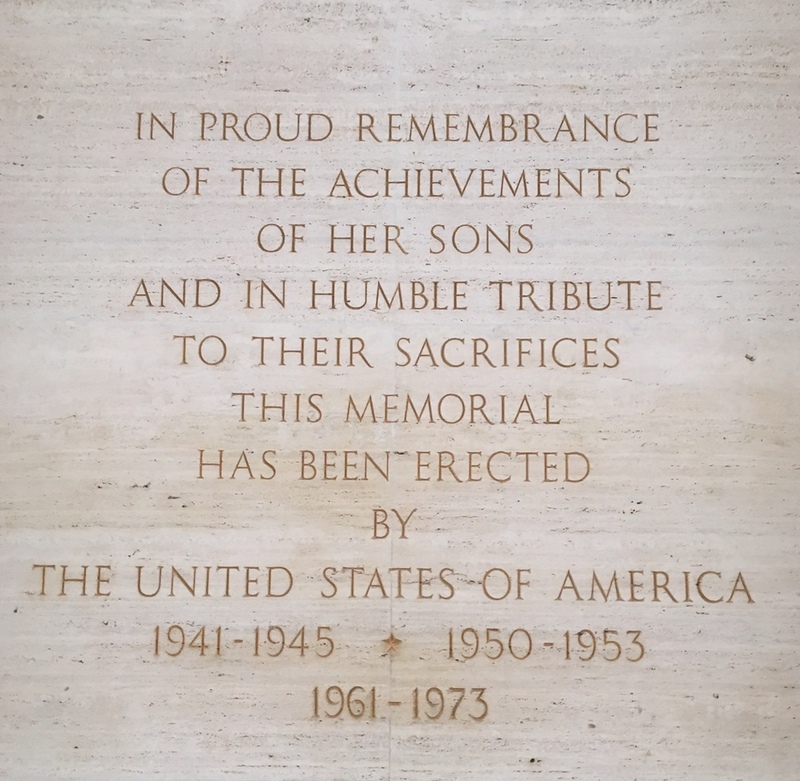 After spending a reflective morning on these grounds, it's easy to see why millions of visitors have paid their respects to those who have served by visiting this tranquil memorial. Please share your time by writing short letters, baking some treats, visiting someone to help them pass the time, and donating any extra resources. Nothing beats the feeling of making a difference. May you and yours be blessed with the true spirit and joy of the holidays! ALOHA FROM JENNIE: The U.S. Navy's Blue Angels touched down on Oahu this week in anticipation of putting on two airshows. Upwards of 110,000 spectators are expected to attend the events. Residents on the island's western region got to feel the power of these planes streaking overhead on Thursday, rattling residential windows and exciting our neighborhood dogs. The roaring engines were again heard and felt for an hour late Friday afternoon as the Angels 'learn the Hawaiian airspace' via a practice session. During the weekend shows, areas of Oahu's airspace will be restricted by the FAA, causing rolling delays at Honolulu Airport from noon till five. Residents and visitors alike are looking forward to these incredible precision Navy air shows on Hickam's field. The keikis (kids) will especially enjoy the aircraft exhibitions and fun zone with games and rides, and there are food booths for everyone. Has the Blue Angels visited your neck of the woods? Hope some of you will share your comments if you were able to go to their airshows. ALOHA FROM JENNIE: Oahu is privileged to be one of only four U.S. stops for the SolarImpulse2, a Swiss long-range solar powered airplane that is currently flying around the world without a drop of fuel. The aircraft weighs 5,100 pounds, has a wingspan in excess of 200 feet and carries more than 17,000 solar panels which charge during the day in order to power the plane at night. Pilot Andre Borschberg flew for five days and nights straight, from Nagoya Japan, over the Pacific Ocean, non-stop to Hawaii and landed at Kalaeloa Airfield on West Oahu early Friday morning. Imagine the discipline it takes to sit for that period of time in an unpressurized, unheated single pilot cockpit, sometimes wearing an oxygen mask for the high altitude portions of the flight, typically cruising at 30 to 40 miles per hour. He and company co-founder Bertrand Piccard are alternating the pilot duties throughout the various legs of the ‘around the world’ journey, with the Japan to Hawaii stage being the most challenging. They started out on March 8th from Abu Dhabi and have already visited Oman, India, Myanmar, China, and Japan prior to arriving in Hawaii. From here, they will move on to the U.S. cities of Phoenix, Chicago and New York City. Pilot Borschberg remarked in local news interviews that he’d like to do some surfing while on the islands. Kudos to the organizers at Kalaeloa airfield and the University of Hawaii who set up Hanger 111 for a half day educational event which was open to the public. Hundreds of us started lining up an hour prior to the 9 a.m. opening, and were ushered through in small groups to view detailed displays, informative videos, and of course the airplane itself with its wide wings and compact cockpit, gleaming and graceful. The inquisitive audience ranged from scholarly looking geeks to adventurous athletes to awestruck keikis (kids)--it was a lot of fun seeing so many gathered from all different walks of life. For those of you who won’t get a chance to see the aircraft up close and in person, we hope that you’ll enjoy these photos and video. It’s our sincere hope that the SolarImpulse team achieves all of its goals and dreams, and that we did indeed catch a glimpse of the future today, when this renewable energy technology can evolve to the next frontier of aviation. 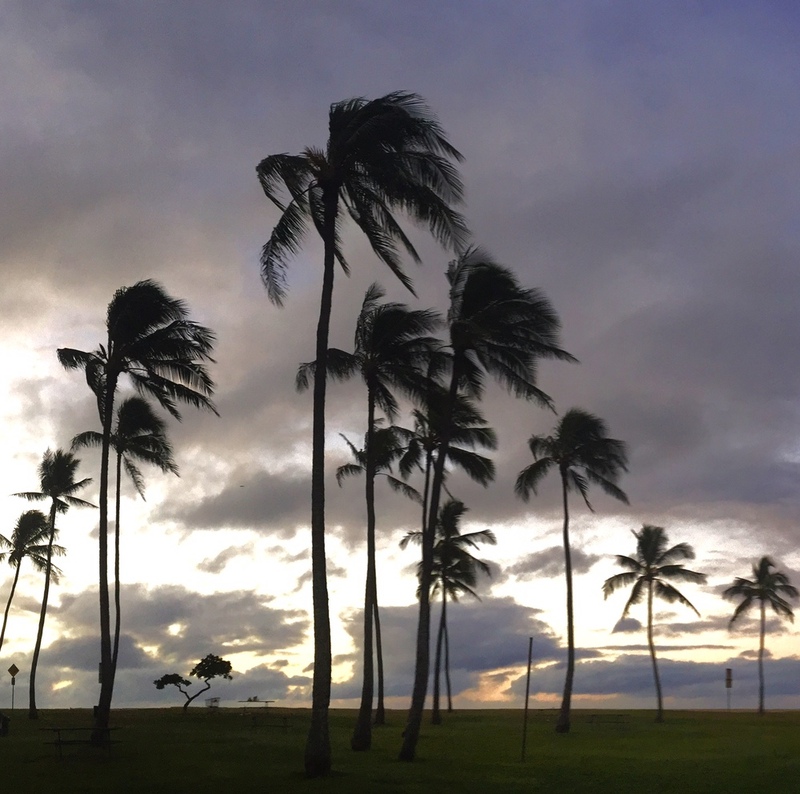 ALOHA FROM JENNIE: How did your hometown look and feel on the last day of year 2014? Due to our time zone status, Hawaii has the distinction of being the last state in the union to ring in the New Year, so when the ball drops in New York City's Times Square at midnight on the continental East Coast, islanders are enjoying dinnertime at 7 p.m., with a full five hours to go before 'our turn' to welcome 2015. We bring you the sights and sounds of our final eighteen hours of year 2014, from 6 a.m. to midnight. 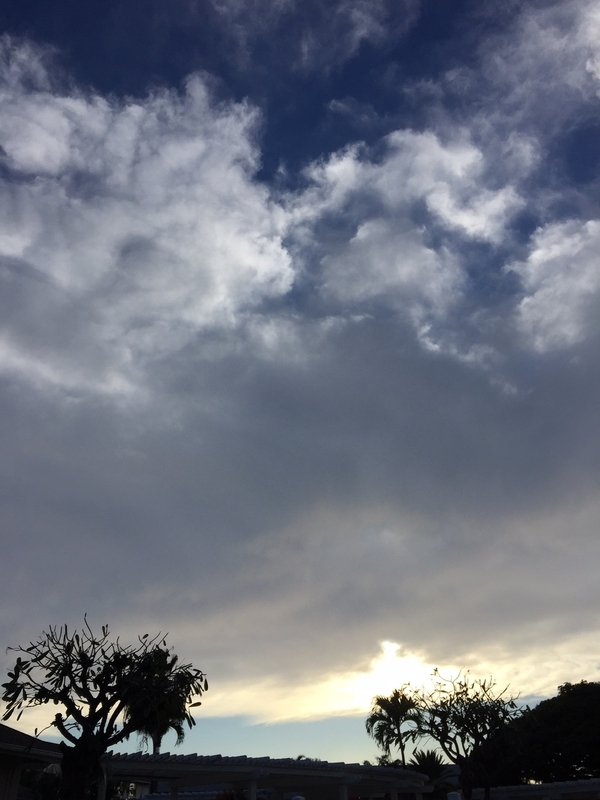 The heavy rains and traffic jams from the preceding day have faded, and at dawn we awake to nippy (for us) breezes and temperature in the 60s. Traffic is lighter than usual as some people have a full or half day off, but the cars that are on the road seem to speed towards their destinations with a sense of urgency. It's time to pack in all the final errands of the year, clean out the old cobwebs at home, literally, and prepare for the new year. Shops in Chinatown are filled with shoppers seeking char siu (roasted pork) and duck, while sales of fireworks (with permits) and alcohol are brisk. 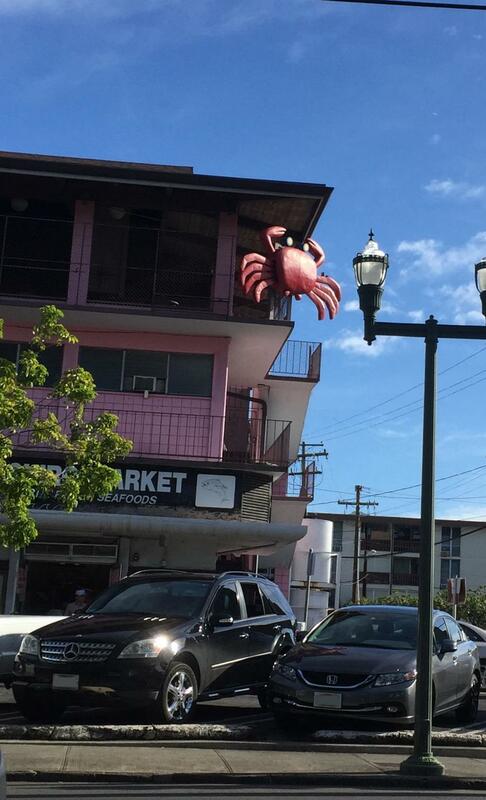 Tamashiro fish market, with its traditional crab building fixture, is doing fast paced sales of fish, sashimi, and poki, all island favorites--luckily the fish supply has been plentiful this season. A local florist supplier is moving stocks of discounted Christmas poinsettias along with vibrant bouquets of fresh cut flowers to admiring customers. Firework displays on Oahu will be taking place during the big metropolitan block party at Kakaako Waterfront Park located near Waikiki/Ala Moana. Over 15,000 attendees are anticipated for the area's events which include Ferris wheel rides, food and game booths. A barge in Waikiki is expected to set off 1,800 shells over the ocean, including designs of palm trees and falling leaves. The Kahala Hotel and Ko'olina resort on the island's leeward side will have shows of their own at the stroke of midnight. President Obama and his family and friends are wrapping up their 12th vacation day in their Kailua location after a day of golf. Households are setting out Kadomatsu plant arrangements by their entryways. Bamboo and evergreen pine symbolizes prosperity and longevity, and plum trees represent stability, patience and consistency, desirable traits with which to take on the new year. Friends and family exchange mochi, usually the sweet rice cake morsels pictured here. Mochi is also used in savory preparations, such as soup and seafood, or grilled and coated in different sauces. The traditional pounding ceremony of the rice symbolizes the beating of ku (suffering) into submission. As the day draws to a close, the atmosphere turns festive as family and friends begin to gather. Care is being taken by the owners of their beloved cats and dogs to make them as comfortable and secure as possible throughout the night. Everyone is starting to look forward to ushering out the tired year and beginning afresh with new possibilities. Across the globe, 2015 appears, first in New Zealand, making its way across Australia, Japan, China, Russia, Germany, England, Brazil, the coasts of the United States and Canada on Atlantic/Eastern time zones, then Central, Mountain, Pacific, Alaskan and Hawaiian, and finally reaching American Samoa. Here on the islands, we have the added benefit of ringing out the old year while enjoying the tranquility of a final year 2014 sunset. Various events and revelry build up steam, including a 'pineapple ball drop' in the town of Millani. Finally, the spectacular firework displays across the state welcome 2015 with hearty bangs and booms. As we close the door on 2014 and look forward to a fresh year, may your next chapter be filled with peace, prosperity and good health. 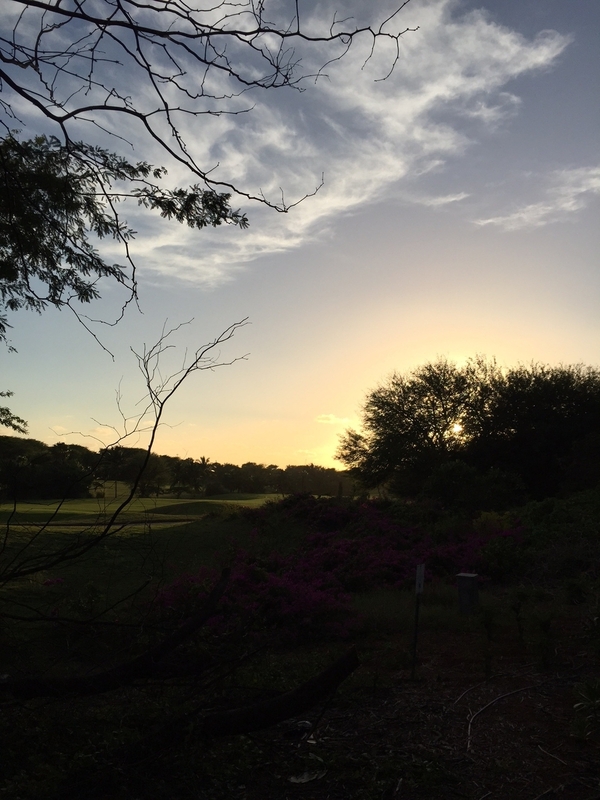 Hau'oli Makahiki Hou (happy new year)! Who Can We Touch This Holiday Season? ALOHA FROM JENNIE: With Thanksgiving and the December holidays around the corner, we breathe a sigh of relief on making it through another year, enjoying the privilege of living in a beautiful state that is part of a powerful and relatively prosperous country, full of bountiful resources and independent citizens, with opportunities and freedoms not as readily available in the global landscape. As I reflect upon the people that I’ve interacted with over the past year, I see those of us who have just lost a loved one, some after a long illness, some unexpectedly, some tragically. This first set of holidays after the loss will be full of grief and memories of happier past times. Nothing can take away the pain, not really, but hopefully there can be some comfort through the strength of friends, family and/or clergy. We see people who have had setbacks, who will need to deal with the disappointment of their children during the holidays, too young to understand why they are not in their foreclosed upon homes anymore. True, things could be worse, there are those who rent an apartment, or pay for a weekly room, or live in their cars, or a tent. I admire the fortitude of all those who are ‘making do’, as well as military families who can’t be with their loved ones during the holidays. No wonder the lower and middle class are the backbone of America. Now and then, I see children of privilege, those who have never been without a roomful of presents under the holiday tree, who have had the best education that money can buy, and yet they’ve developed a strong sense of duty and compassion, and as adults join Doctors without Borders, or charitable foundations, not for the tax write-off or the lip service of being involved, but to sincerely better the lives of those less fortunate, because they actually see the need. There are so many who donate anonymously, or who set up private endowments, in addition to all of the public taxes that they pay. Hopefully, their voices and actions can motivate our leaders. Finally, I see senior citizens grappling with the sadness of losing their circle of friends and family to old age and dealing with senior issues such as the high cost of medications, fixed incomes versus escalating expenses, their deteriorating physical ability and increasing aches and pains, and the loneliness of a world passing them by. Tasks and routines that were simple are now a struggle. Technology invades everything from telephones to market checkout lines. Everyone else is seemingly smarter and faster, doing everything with ease. The hustle and bustle of holidays are just additional hurdles, making the isolation and depression more pronounced. And yet, I also see the resilience of the senior spirit. They didn’t get to where they are without a lot of trial and error, gumption, and crazy experiences. They’ve raised the children that are now out conquering the world, so to speak. Our fiercely independent seniors are the ones that help the housebound with grocery trips, and watch the children of a neighbor caught without a babysitter now and then. They persevere with home upkeep and repairs, and walking and bathing their dogs, even though it would be just so much easier to stay in bed. 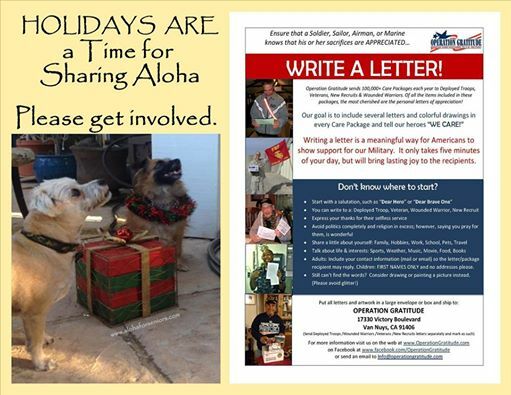 They volunteer to write letters to deployed troops, despite arthritic fingers and dimming eyesight. These seniors who push on, often by themselves with little support, because things just need to get done, are the ones that make their generation the foundation of what we have today. As the new year approaches, I wonder what the future holds, who will give up, who will soldier on, who will remember their roots as things get easier and better, who will try to make a difference, no matter how small. Our wish to you is that wherever you are in this walk of life, that there are moments of success in your personal struggles, along with contentment, comfort, and tranquility. Happy holidays.